Customize t-shirts, hoodies, sweatshirts and jackets for your team for the next event. A versatile design that offers endless possibilities on any project. 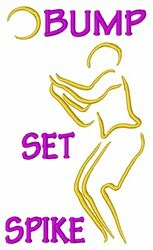 Satin Stitch is happy to present Volleyball Player Sport machine embroidery design which has 3744 stitches and is [52.36 mm x 88.56 mm] large. If you would like to view more embroidery patterns please search on our embroidery designs page.